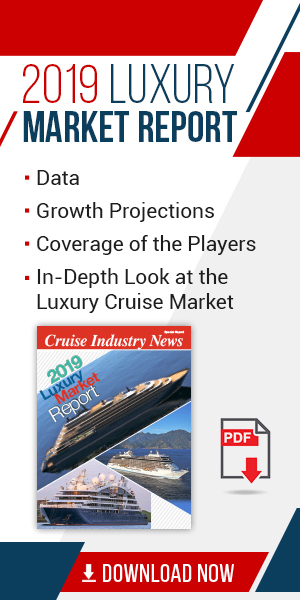 The runaway growth from TUI Cruises targeting German cruise passengers will have an unintended effect for the cruise line: it will become the biggest operator in Europe offering a premium level product experience in the near future, according to the 2018-2019 Cruise Industry News Annual Report. Come 2019, the brand will have a fleet of six modern large Mein Schiff ships, plus the existing Mein Schiff 2, for a total of seven vessels and over 17,500 berths, with a projected capacity of over 650,000 guests. This will move them past P&O UK, which has been the largest premium European brand for some time, which has a projected 2019 capacity of around 550,000 cruise passengers with seven ships and 17,311 berths. Other premium lines in Europe include Cunard Line, Fred. Olsen and Saga Cruises.